SEE VIDEO AMONGST THE PHOTO GALLERY! Andrea's Villa is located in Vagliagli. A Tuscan gem deep in the Chianti - the owner is a talented Chef known to the public as 'A Man from Chianti'. At Arceno Rentals Club we have established a relationship with this acclaimed Chianti born Chef who has delighted the palates of many of our guests, the locals and more. Andrea has made available to us his Villa and precious kitchen, fully equipped to the highest professional level, to offer our Guests the ultimate 'gourmet' experience. During your stay you will be able to enjoy the beautiful Tuscan countryside, vineyards and olive groves and to experience the unique flavours and style of Tuscan cuisine. You will be greeted on your arrival by an inclusive* 'welcome basket' filled with a delicious selection of quality local produce including wine, enough for your first evening meal and breakfast. An inclusive* dinner can be cooked for you at the villa and your choice of menu will be agreed beforehand with Andrea from a wide selection of quality produce and fine Tuscan wines. The day of the dinner can be pre-arranged to meet your vacation itinerary. Wine tasting at the nearby ‘L’Oliviera’ winery is also offered inclusively*. With prior notice Andrea can give cooking lessons at the Villa or be your host and take you for ‘slow food’ tours in Chianti. Details are available from our Concierge Manager, Gaia, who is happy to organise, gourmet tours for you in the Chianti, Montalcino and Montepulciano areas. Eight kilometres from Siena and the highway to Florence, Andrea's Villa is the ideal location for travellers exploring Tuscany and particularly Siena, San Gimignano, Volterra, Montalcino, Montepulciano and Cortona. Using a car is recommended but if you do not wish to drive on excursions, our Concierge can arrange a chauffeur driven car. Andrea’s Villa is on an incline with views over the Chianti hills which may be enjoyed from the exclusively private pool, along with an ‘aperitivo’ or glass of wine. The large pool is perfect for ‘cooling off’ with plenty of poolside space in the shade or sunshine to relax in style and comfort. The charmingly rustic Villa is set over two floors - the upper floor accessed directly from a delightful garden has the living/dining room, kitchen and a bathroom. To one side a covered balcony overlooks the vineyards. The high ceiling is of traditional chestnut beams and terracotta tiles. The living/dining room has a fireplace with wood burning stove and a large archway leads to the kitchen. With stove, oven, hob and the traditional open fireplace for roasting and grilling those traditional ‘Chianina’ steaks. The kitchen is fully kitted out for professional use. To one side of the front door is the bathroom with lavatory, bidet, shower enclosure and wash basin. At the far end of the living room a stairway leads down to the lower floor. On this level are three bedrooms each with double beds and one also with a single. Each has storage and wardrobes. Two bedrooms lie off a corridor that leads to the main bathroom with double wash basins, lavatory, bidet and a huge shower enclosure. To one side of the bathroom a doorway leads into the third bedroom and then through ‘French’ doors to a covered outdoor seating area and on into the garden. Westwards in front of the bedrooms is the swimming pool with plenty of space for the deck furniture in the shade or in the sun. Here are views over the vineyards and hills of Chianti. The lower garden is turned over to a kitchen garden that provides organic vegetables - the base of Andrea's magical cooking. In managing the property, Arceno Rentals Club applies high standards and we offer the Villa spotlessly clean with mid week cleaning and change of linen. House wine, a cocktail bar, olive oil and coffee are supplied throughout your stay. Our complimentary Five Star Concierge is also a ‘phone call away to assist you with your needs. Midweek change of towels, towels also provided for the pool. On arrival a welcome basket of quality food and wine is offered (weekly stay or longer). The kitchen is stocked with herbs, spices, salt, pepper, coffee, tea and house wine. The owner is a talented chef so the kitchen is well equipped with any utensil one can think of and plenty of dishes. Fully equipped and in true Tuscan style it also boasts an open fireplace for those roasted and grilled meat dishes typical of the region. 'Chianina' steak anyone? 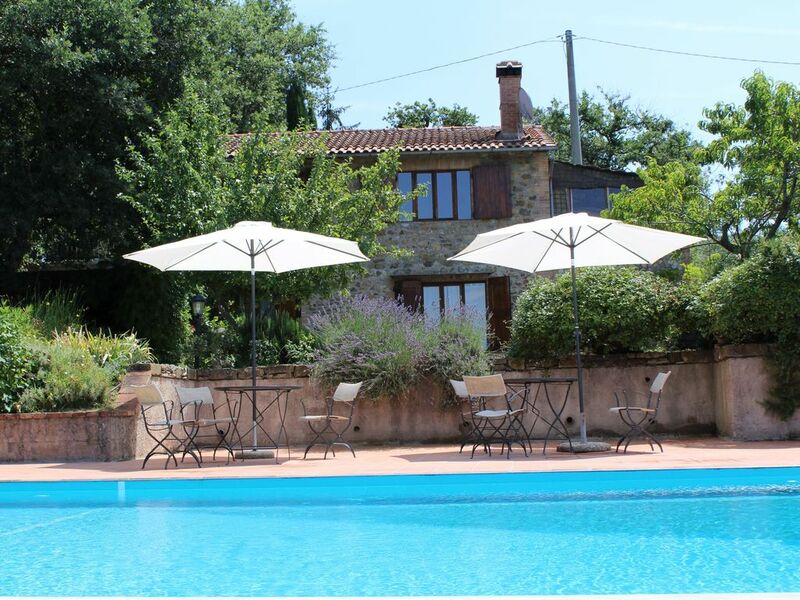 The pool is exclusively private with lots of space around it for the pool furniture with views westward over the vineyards and hills of Chianti. Our 'FULLY INCLUSIVE' weekly RATES provide a generous 'WELCOME BASKET' of quality food & wines from local suppliers, enough for the first weekend. A continuous supply of FREE quality Arceno Rentals Club HOUSE WINE throughout stay. A FREE BAR of branded spirits and Italian liqueurs is also provided to be enjoyed during your stay. A dinner to be cooked at the house is inclusive in the price and one wine tasting at the nearby farm "L'Oliviera". Andrea is available for cooking classes, further dinners cooked at the house and to accompany you during "slow food" tours around the Chianti region. It’s a fun house to be in! Nothing of Andrea’s villa is common. All is unique here in its own way, the layout of the house, the beautiful views, the location and the owner himself . We enjoyed our stay and will be back. Andrea’s cooking is exceptional, he involves his guests and makes them discover the secrets of Tuscan cooking while having fun and a good glass of wine. Perfect! Staying at Andrea’s Villa was a bit of a bet for us, we know the area very well as we travel every year to the Siena area. Art, culture but mainly good food and wine attracts our group of friends. We were three couples starting our “gourmet” tour and we found this new property, the offer was excellent and we chose it as a dinner cooked by Andrea (a renowned local chef) was included, we decided to give it a try for the first part of our holiday. What a pleasant surprise, the house is great, clean and well appointed and equipped, really a Tuscan house. Andrea cooked a fantastic meal and and the teram of Arceno Rentals have been so supportive with their suggestions where to go and what to do. We know the area very well and Gaia, the concierge manager, managed to surprise us with new ideas of where to go and what to do that only a real local can propose. I can but praise the house, the hosts and the location. Surely a good start for visiting the area and staying with family and friends in a comfortable cosy house. A beautiful farm house in the heart of the Chianti region of Tuscany. The house sits right at the end of a family vineyard. The sunsets are spectacular. Cooking lessons with Chef Andrea were a highlight as he really takes pride in the food of the region and local producers from the area. Many small hill town villages nearby to visit. Highly recommend. Famous for food and wine there are many places to go and see in order to discover the flavours of Chianti. As passive or active participants, eating and drinking the local produce or by taking cooking lessons or learn about wine making at source. Other activities include golf, tennis or horse riding. There are thermal spas and for a grand day out even the seaside. Packed full of history and art, an almost endless list of galleries, exhibitions, museums, churches, palaces and festivities await to be discovered. Andrea's Villa is a short eight kilometres away and there are winery tours in abundance in the area. A favourite restaurant is ‘La Bottega del Trenta’ in Villa a Sesta for a fantastic fine food experience and a warm welcome by Hélène the owner. One of the main events in Siena is the famous ‘Palio’ horse race held annually on 2nd July and the 16th August. If visiting Siena around these dates Arceno Rentals Club can arrange the purchase of tickets, for an ‘unparalleled experience'! A car is necessary to travel around. The region is stuffed with history, art, food and wine. With Italy’s excellent road network, Florence, San Gimignano, Le Crete, Pienza, Montalcino, Cortona, Arezzo, Perugia, Assisi, Gubbio and Todi are within easy reach for day trips.